Near the grade crossing on Riverside Drive, the operator of a ballast-spreading machine was busy, well, spreading ballast. I had never seen that done this way. The operator was just about finished there, but I caught a few seconds of the work in the video above. Sure beats shoveling the rocks by hand. The crossing gates evidently had been shut off for this work. Otherwise they would have blocked traffic as long as that machine was working close by. My ride out Riverside took me back to town via Bryant Drive. On Water Avenue, a crew was doing a different kind of work. Straightening out the rails, one of the guys in hard hats explained to me. He pointed east, where we could see up-and-down and sideways undulations in the rails. The working of this machine (video below) is intended to take care of that, as I understood the explanation. Replacing cross ties was part of the job. Hundreds of brand news ties had been stored along the track east of Burkhart Street. Now they’re gone, having been put under the rails where they belong. 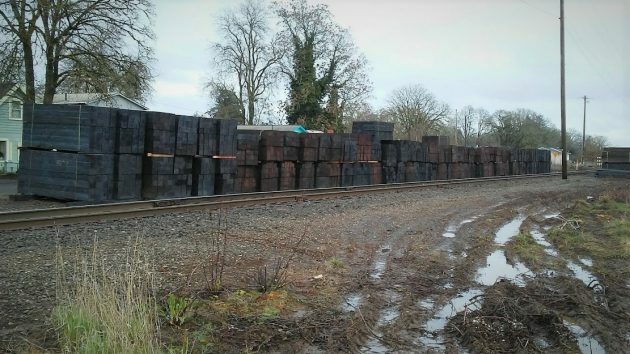 Some of the cross ties stacked along the track back in February. Ahhh work that was once done be a section crew (gandydancers) with shovel, hammer, and jackingbar. Brutal work. But it was employment for my maternal grandfather in his youth. Thanks HH for the videos on the track maintenance work. At one of our dinners, Milton recalled traveling to an Asian country in the 1960s and visiting a worksite where a new canal was being built. He was shocked to see that, instead of modern tractors and earth movers, the workers had shovels. He asked why there were so few machines. It isn’t the Canadian Railroad Trilogy, but Hasso never claimed he’s a balladier. Sometime a video and some history about the railway electrical station out that way would be fun for people. It also links to the earlier one in 2015.. Thanks for videos like this, Hasso. Very interesting work we don’t see normally. And a BIG thanks for taking your videos in the proper horizontal format. So many nincompoops use vertical format and pan back and forth, back and forth, back and forth…..you get the idea.